We’ve heard from ten authors so far who expressed interest in an appearance at the ALL-IN block party June 25th on the Noble County Courthouse square … and I’ve got contact information on five more who I hope to hear from soon. Anyone with a Noble County connection who’s published a book is welcome, but I’m hearing there’s limited space, so hopefully we’ll firm up the final list soon. Meanwhile we’re up to 129 names of present and former Albion firefighters for the honorary plaque to go in the fire station. That includes 15 chiefs! Not all at the same time, of course. I still have some records to check, and I’m sure there are still more people to hear from with names, or lists of names, they remember from Albion’s 125+ years of volunteer firefighting history. 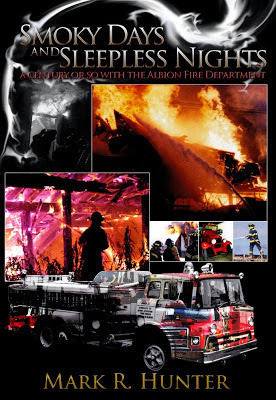 It helped that there were dozens of volunteers mentioned in Smoky Days and Sleepless Nights: A Century or so With the Albion Fire Department, from my previous research … including the entire membership of the Hook & Ladder company in 1888. Nice to have a head start. Yes, it's nice--and hopefully more to come, too. I think it's great you have documented the history. Mind you, I did misread plaque as plague at first...... that could be interesting! LOL! Oddly enough, we didn't get a lot of those in our Albion's history!